Here is a special dish that should delight not just chicken lovers but everybody. 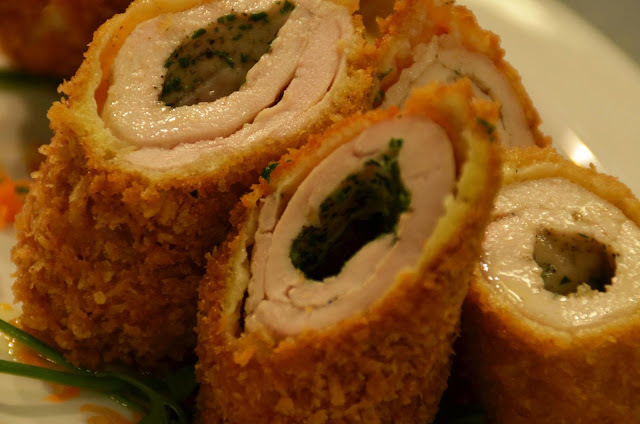 Magic Chicken A La Kiev uses chicken as a wrap for a log of butter and some herbs and spices to produce a gustatory adventure that will be long remembered. For those wanting new ways to do chicken, here is it. 1. Lay chicken between two sheets of plastic wrap. Pound each fillet until very thin, being careful not to tear holes into the meat. Season with MAGGI MAGIC SARAP and black pepper. 2. Roll a log of butter over chopped parsley. Place a butter log in the middle of the chicken fillet and roll tightly. Chill for at least 10 minutes. 3. Coat each rolled chicken breast in flour. Dip in beaten egg and roll on breadcrumbs. 4. Do a double coating of the egg and breadcrumbs. Chill again before frying. 5. Deep-fry chicken breasts in hot oil under golden brown in color. Serve immediately.